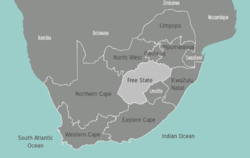 The Free State Province, , in South Africa is situated in the heartland of the Karoo semi-desert. Northern Free State - Large portions of this area still show the scars of the Fredefort Dome meteor impact. Thabo Mofutsanyana - Eastern portion of the Free State, bordering onto the Lesotho highlands to the south. The former Oranje-Vrystaat (Orange-Freestate) was the heartland of the white Afrikaaner population and therefore most people in this region still speak Afrikaans as their first language. It was one of the first independent states, before joining the South African Union and the people here still live up to the voortrekker traditions of braaing and the Afrikaaner lifestyle. The rich soil and pleasant climate allow a thriving agricultural industry. With more than thirty thousand farms, which produce over 70% of the country's grain, it is known locally as South Africa's breadbasket. Bloemfontein is the judicial capital of South Africa, mainly because the founders of the South African Union wanted to unite all people, including the Afrikaaner population. The Free-State is an important agricultural area in South Africa with beef, and maize the primary products. Afrikaans is the first language of many people in the Free State, but most will be bilingual in Afrikaans and English. Be prepared for understanding through a strong Afrikaans accent. The N1 highway runs through the Free State. It comes from Cape Town and goes further to Johannesburg and Pretoria and from there to Harare in Zimbabwe. Use this route when coming from/going to Mozambique, too. The N3 runs in the east of the Free State through Harrismith. Use it to go to Durban or the Gauteng area. The N8 goes from Bloemfontein to Kimberley and further to Upington. The N5 only serves as a connection between the N1 and the N3. Bloemfontein Airport  has flights to Johannesburg and Cape Town and some other cities in South Africa. Flights are operated by the South African Airways  family. Best by car, as there are little means of public transport and great distances between each of the towns and cities. Always have enough water with you, in case your car has a break down. Tell your last hotel where you are going to and which route you use, especially when going into a less populated and rural area. North-west are Kimberley with its diamond museum and Upington near the Kgalagadi Transfrontier Park. South-west lies Cape Town, the Cape Winelands and the Garden Route. North-east is Johannesburg and the Kruger National Park. South-east is Durban and the Sunshine Coast. This page was last edited on 15 March 2017, at 12:34.